What Keeps Your Dirtbike's Engine Running? Would you like basic information how a dirt bike's engine works? How about tips on how a synthetic oil change can improve your bike's performance? This article can help! If you own or drive a car then there is a good chance that you know how to keep it going. Whether it’s filling up the gas tank, check your fluid levels, or even the condition of your tires. This isn’t because you are a mechanic - but largely because, when it comes to cars, there are all too many people willing (whether you ask or not) to give you their advice and tips. 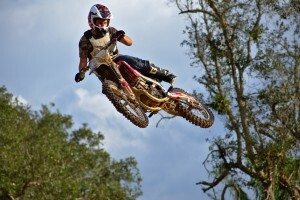 When it comes to dirt bikes, however, information from friends and family doesn’t seem to be as free-flowing. For this reason, USA Synthetics has the following post to offer with some basic information about how a dirt bike’s engine works and the importance of a synthetic oil change as part of regular dirt bike maintenance. What’s Inside a Dirt Bike Engine? You could be forgiven for thinking that there isn’t much which powers a dirt bike. After all, the engine size is a fraction of that compared to your regular car. However, while it might not seem like there is a lot of space you can rest assured that there are more parts working hard inside the engine that you would be aware of. To keep your bike going, a dirt bike’s engine utilizes small and intricate metal engine parts. Each of these parts has been meticulously designed to fit around and interact with each of the other components of your engine. When working together, each of these parts contributes to your engine running and your dirt bike staying out of the mud. Click here to buy AMSOIL 20W-50 Synthetic V-Twin Motorcycle Oil and keep your dirt bike in good shape. If you aren't sure this is the best-suited product for your bike, don't hesitate to speak with an expert at USA Synthetics by calling (405) 388-6170 and ask about the range of high-quality engine lubricants available. If you prefer, check out the online store for further information. That’s Great - What’s the Problem? If you can remember back to your school science classes then you will remember that, when metal interacts with metal at high speed a dunder high level of pressure, friction builds up. Friction brings with it two challenges when it comes to a dirt bike's engine. The first is that friction actively works against the engine. This means that your engine needs to use more fuel and work harder to keep your bike operating at a basic level. When friction builds up, riders can often notice a reduction in engine performance on the track. The second is engine damage. As each of these parts slides and scrapes up against each other, they begin to slice away minuscule chips from each other. In addition to reducing the quality of each of the parts, these small metal chips make their way throughout the rest of the engine where they can cause serious damage and lead to expensive repair work. What Keeps a Dirt Bike Engine Running Smoothly? To prevent this type of damage from occurring constantly as you ride, a dirt bike's engine uses a purpose-designed engine lubricant. Alson was known as general motor oil or engine oil, this fluid coats each of the above-mentioned parts with a protective barrier, facilitating smooth motion and a reduction in friction. Are there different types of protection? When it comes to protecting your engine parts with engine lubricant, the quality of the fluid you put in direct determines just how well your engine will be taken care of. For older engines, a traditional oil can be sufficient. This is the original style of oil and is fine for engines which don't output much power and which aren't used regularly. For modern engines and for serious riders, synthetic oil is often the first choice. Unlikely traditional oil, synthetic oil has been purpose designed to provide high levels of protection and provide your engine with what it needs to perform at its best. Just like all types of vehicle and engine maintenance, the quality of product you use determines the level of performance you can expect. To keep your engine running smoothly for longer, speak with USA Synthetics at (405) 388-6170 and learn about the benefits of a synthetic oil change in Oklahoma City, OK. With a wide range of high-quality AMSOIL products to choose from, trust that USA Synthetics will ensure you get the right advice and the best product for your next synthetic oil change.